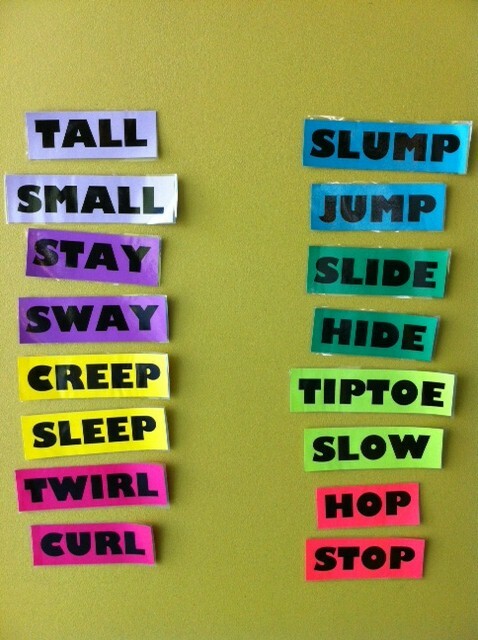 Way back in 2006 when I first started doing storytimes regularly, my good friend Nik (of Narrating Tales of Preschool Storytime) had the idea to print out the words to a favorite preschool storytime song, laminate them, and using velcro, hang them on the wall during storytime. It was SO cool! She was then and is now, one of the most creative people I know. I’m more a “why re-invent the wheel” kind of person so… I STOLE that idea. Mwuahahahahaha! Ok, so not that devious as all you storytimers know collaboration and sharing is a BIG part of our jobs and, let’s face it, one of the most fun parts. Now on to the dang prop already! Oh, but first… hey Nik, is it ok if I steal this idea and blog about it? Ok, great thanks! List of Dances by Jim Gill is an AWESOME song. If you have not used it in storytime go get the CD right now and work it into your next session. Seriously. Do it. Bonus tip: during the part where Jim isn’t giving you any lyrics just have the kids roll their arms or tap their heads or stick out their tongues or something equally as goofy. Got that idea from the Move ‘n Groove workshop at PLA 2010 (Nik and Eliza remember, right?). Could I have put those columns closer together so the picture looked better? Sure. But that’s no fun. The font I used is Gill Sans Ultra Bold and just printed two words per page on different colored paper so that each rhyme pair was on the same color. Check out other storytime props and flannel ideas in the Flannel Friday Archives at Anne’s blog so tomorrow or on Pinterest. Today’s roundup is over on Cate’s blog Storytiming. The velcro strips to hang them on were a pain. Luckily at Old Gibson the walls were cloth so I got the words to stick up on their own! I’ve been using that edited/shortened version of this since I started doing storytimes though. I have it memorized and most of my kids do too, so I stopped using the words. I keep reading all these stupid children’s blog hoping one day it will be worth it. Today it was. I was in it! Saweet. But no really, I remember PLA very well. And that session is the only one of the sessions I remember. Maybe you should just give in and be a children’s librarian already?